Whether from the movie “Ice Age” or from science class, at some point in your life, you’ve probably learned something about the Woolly Mammoth, the Saber Tooth Tiger and the Dodo Bird. What these three animals have in common is extinction. The Woolly Mammoth and Saber Tooth Tiger have been gone for thousands of years now, and the Dodo’s extinction occurred within the last 1,000 years. Over the years, more and more species have been going extinct, but none seemed to be well-known until recently. This is why news regarding Sudan, the last known male northern white rhino in existence, set the world afire. 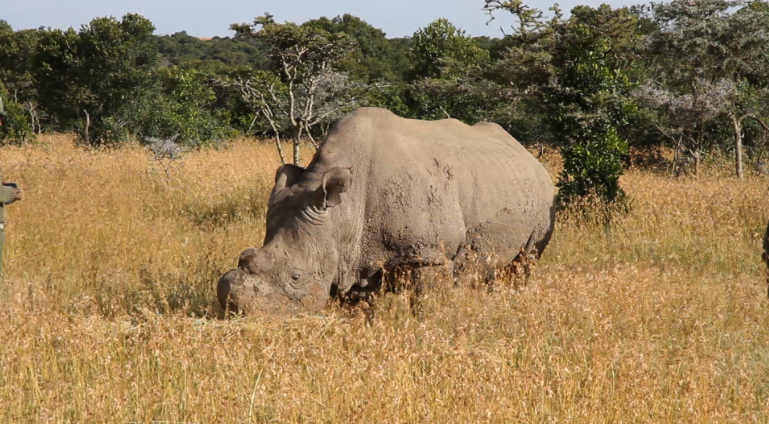 One of the four northern white rhinos, all of which are being housed at Ol Pejeta Conservancy in central Kenya, grazes in captivity. Sudan, age 42, is currently residing at the Ol Pejeta Conservancy in central Kenya, where he is under 24/7 guard and care. If having only one male northern white rhino left is not enough, there is also a grand total of only four female northern white rhinos left in existence. Two of the females, Fatu and Najin, are housed with Sudan in Kenya in hopes that these three will keep the northern white rhino from extinction. Unfortunately, however, the conditions for reproduction are not optimal. Sudan is in his elder years, meaning that he is not the strongest and he has a low sperm count. Fatu is in good shape at age 15, but Najin has weak legs and may not be strong enough to support conception at age 25. Scientists are currently working around the clock, researching other methods of conception in order to save this species. That being said, these other methods are not guaranteed to work, and with Sudan’s older age, time is not on research’s side. Scientists are pressed to work as efficiently and quickly as possible. Although northern white rhinos are wild animals, it is scary to think that their most threatening predators are actually humans. Poachers have been hunting rhinos for years now, as their horns are extremely valuable in the Asian market. Although there is no scientific evidence to prove it, it is a common belief in Asia that the rhino horn is a cure for various sicknesses. Therefore, poachers kill rhinos and sell the horns, which are then crushed up into powder and put into tablets to allegedly cure fevers, strokes and other illnesses. Because this market is illegal but still treasured by many, the trading value of rhino horns has grown equivalent to that of drugs and gold. In turn, these actions have led to the endangerment of northern white rhinos, and now the species borderlines extinction. Nonprofit organizations such as the World Wildlife Fund are taking action and supporting the endangered northern white rhinos by asking people to donate and to refrain from purchasing rhino horn products. These actions may aid in putting an end to the rhino horn trade market, but this cannot undo what has already been done. The root of the problem is poaching, so hopefully the current condition of the northern white rhino will send the message that even more popular species are extremely vulnerable, and human tampering with their lifespans only causes damage in the animal kingdom. At the very least, hopefully this near extinction of the northern white rhino will harshly remind the public of the risks regarding the hunting of endangered species, and, for now, I keep my fingers crossed that Sudan can help save his species from disappearing into the past.